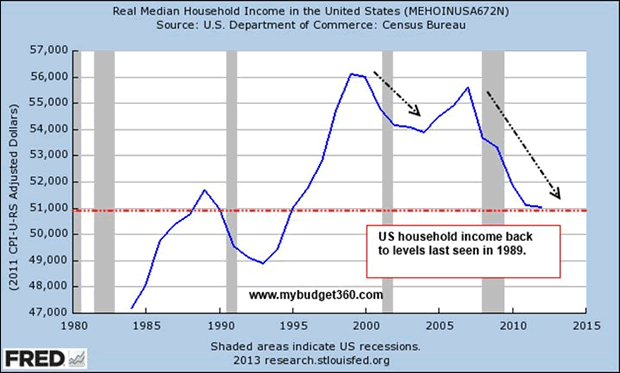 Pulitzer Prize-winning journalist David Cay Johnston says the incomes of the bottom 90 percent of Americans, after being adjusted for inflation, grew by only $59 on average between 1966 and 2011, over the same period the average income of the top 10 percent of Americans grew by $116,071. The U.S. top one percent of income earners accounted for 17 per cent of national income in 2010 - the top one percent in Canada took in 10.6 per cent of national income in 2010. In the U.S. the average income of someone in the top 10 percent of income earned was 15.9 times greater than the average income of someone in the bottom 10 per cent of the income distribution - the Canadian ratio is 8.9 percent. U.S. households, on average owe 138 per cent of their after-tax income and even worse off are Canadians, on average Canadians owe 165 per cent of after-tax income. 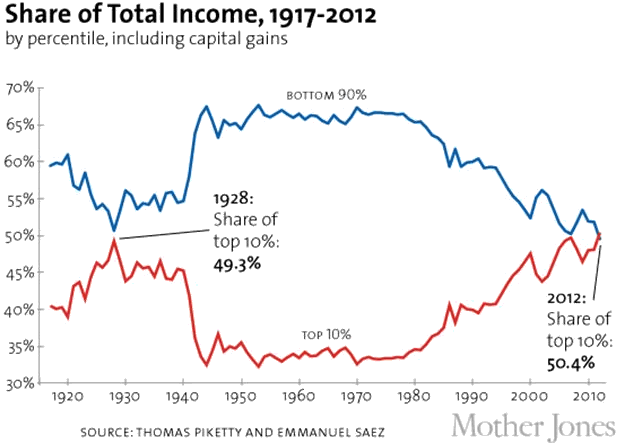 What is causing the rising inequality of incomes and wages? From 1978 to 2012, CEO compensation measured with options realized increased about 875 percent, a rise more than double stock market growth and substantially greater than the painfully slow 5.4 percent growth in a typical worker's compensation over the same period. Measured with options granted, CEOs earned 18.3 times more than typical workers in 1965 and 26.5 times more in 1978; the ratio grew to 136.8-to-1 in 1995 and peaked at 411.3-to-1 in 2000. In 2012, CEO pay was 202.3 times more than typical worker pay, far higher than it was in the 1960s, 1970s, 1980s, or 1990s. Over the last three decades, CEO compensation grew far faster than that of other highly paid workers, those earning more than 99.9 percent of other wage earners. CEO compensation in 2010 was 4.70 times greater than that of the top 0.1 percent of wage earners, a ratio 1.62 higher (a wage gain roughly equivalent to that of 1.6 high wage earners) than the 3.08 ratio that prevailed over the 1947-1979 period. According to data compiled by the AFL-CIO, the average CEO pay at 327 of the nation's biggest companies is $12.3 million when you include salaries and all other incentives. The average U.S. worker makes $35,204 a year. The CEO at 327 of America's biggest corporations works 5 hours to make what the average American worker makes in a year. That's average salaries I'm using, not median, which would of course be much lower - the average salary includes large white collar pay checks. The 100 top-paid CEO's of companies listed on the Toronto Stock Exchange's composite index were projected to earn, by noon of the first working day of 2012, $44,366. That's quicker than in 2009 when they had to sweat it out till 2:30. The average Canadian's salary was $47,200 in 2012. Krugman's article, although dated October 2002, is a must read. Deng Xiaoping, who was China's first leader after Mao said "Some should be allowed to get rich first." Sounds like our western plutocrats took that bit of wisdom to heart and waddled to the trough with it.So get in line, although in times of such lop-sided income inequality you might be waiting a while. The air stinks when you're in a herd, the water tastes terrible, the view is monotonous and the grazing, when you finally get to it, is to say the least not the most succulent or tastiest. Being all wrapped up in Honey Boo Boo's (or the bearded wonders on Duck Dynasty) latest escapades keeps the herd enthralled and complacent and the circus plays on. You need to become an outside the herd animal and put your family's financial health and safety on your radar screen. Is getting ahead of the herd on your radar screen? If not, maybe one should be.